Pasta | TastingSpoons | Page ? Posted in Pasta, Salads, on August 18th, 2008. When I saw this recipe title my head tilted sideways and a big question mark floated skyward out of my ear. No, you don’t barbecue the salad. Who whooda thunk of putting barbecue sauce in a pasta salad, I ask you? The recipe came into my inbox from Cook’s Illustrated (I get an email epistle from them regularly) and this recipe was in the list, but credited to Cook’s Country, a magazine I don’t subscribe to. It sounded so incongruous I had to go investigate the recipe further. Pasta is something we severely limit around here, and not because we don’t like it. But when I read this, it just sounded so different I had to try it. Right off the bat, I didn’t have scallions (used red onion instead) or red bell pepper (used some baby mild mini peppers instead), and I prowled my refrigerator for BBQ sauce and finally found something close (an Ancho Chile Spicy glaze). But hey, necessity is the mother of invention. I wanted to make this salad, and I used what I had on hand. Once prepared, I dipped my spoon into the bowl and was absolutely wow-ed by the taste. I l-o-v-e-d it. We had it with our dinner and for leftovers a day later. I made a half batch. After two dinners, I added more vegetables to the mixture and prepared a small amount of additional mayo and bbq sauce which the salad needed. The vinegar is an important aspect of this salad – when I added the veggies with the added mayo and BBQ sauce, at first I didn’t add the vinegar. The salad was flat. If you do add more veggies to it, you’ll need more dressing. Also another dash of hot sauce too. Next time I’ll try it with low-fat mayo. With all the flavor in the salad already, it may not need the boost of full-fat mayo. 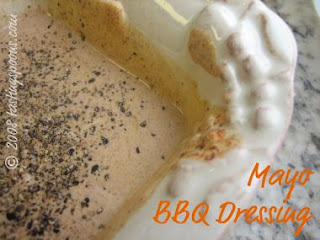 The dressing is simple: mayo, barbecue sauce, cider vinegar, some spicy hot sauce (I used a Vietnamese one I keep on hand at all times), chili powder, garlic powder, cayenne (actually I omitted this because I used a spicy barbecue sauce) and black pepper (see photo with the pepper dotting the top). The dressing is poured on top of the pasta which is mixed with bell pepper, celery and the onions (scallions). It took about 15 minutes to make, not including the time to heat the pasta water. You could eat it immediately (although it would be warm or room temp), but they recommend letting it chill for 30 minutes or so, but it will keep for a couple of days. Perfecto for a summer barbecue dinner. You will be missing out if you don’t try this one. I’m so excited when somebody finds a way to make something ordinary into something fabulous. Why didn’t I think of that? Cook’s Notes: use more veggies if you’d like. Tomatoes would be a nice addition too, particularly if they’re good, ripe ones. Also cucumber. 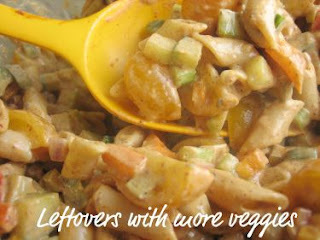 Leftover chicken or turkey could also be added to be a nice main course. If you add more veggies, you’ll need more dressing. 1. Bring 4 quarts water to boil in large pot. Add 1 tablespoon salt and macaroni and cook until nearly tender, about 5 minutes. Drain in colander and rinse with cold water until cool, then drain once more, briefly, so that pasta is still moist; transfer to large bowl. Per Serving: 343 Calories; 20g Fat (50.3% calories from fat); 7g Protein; 37g Carbohydrate; 2g Dietary Fiber; 8mg Cholesterol; 250mg Sodium. Posted in Pasta, Pork, on May 30th, 2008. I know, the name is odd, isn’t it? I suppose I could just change the name and claim the recipe as my own, but that’s not fair to the originator of this sauce, so I’ve always referred to it by her title. It’s not just any old spaghetti sauce, as we’d be likely to call it, and surely Camille Stagg meant for us to take notice. This isn’t your ordinary red – either the wine OR the sauce. Camille Stagg is a well-known journalist, travel writer, and must live in Chicago, as she’s written a book about gourmet haunts in that town. She consults with some wineries and wine distributors (clubs), as I found other recipes listed by her in a couple of places on the internet. Many years ago we used to have two bottles of wine delivered to us each month by a small company up in Emeryville, California. And each month the wine purveyor included a write-up about the wines in the box, AND a recipe suitable for that wine. Likely this recipe came in with a box of zin, since it calls for the wine in the recipe. It sounded so intriguing, I had to try it. We were going to have a wine tasting at our home a week or so later, and I asked each guest couple to bring a bottle of wine and food to serve with it. Specifically, they were to bring something that would complement their wine type. We stood around our kitchen island with 4 (small) glasses of wine in front of us, and sampled food with each wine. It was fun, and we really liked this sauce. 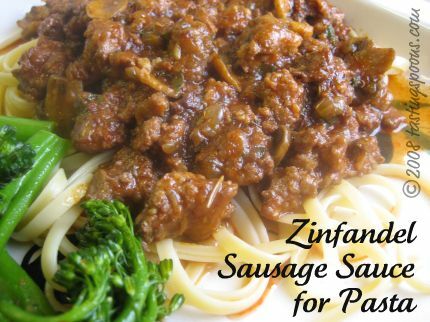 Having not made this for several years, I had to refresh my memory about what was different about it (it uses nearly a whole bottle of zin for 5 pounds of sausage). Once you combine the sausage, onions, mushrooms, garlic and seasonings, you can either simmer it on the range, or put it in a crockpot for long, slow simmering. I did the latter and kept it at high for about 4 hours to help boil off the wine. The sauce is thin to start, and must be simmered down to reduce it. Obviously, it’s a heavy sauce, redolent with the winy taste, and complemented with a large quantity of mushrooms. It’s an extremely dark-colored sauce – zin wine certainly stains nearly anything it touches anyway, so the meat takes on the dark red color as well. You can use your own combination of sausage – the recipe calls for half hot and half sweet. It’s zesty, I’ll give you that! Zinfandel is a zesty wine in and of itself – most people describe it as spicy. And the hot/spicy sausage ups the ante. If you don’t like spicy sausage, use all sweet Italian. This freezes well. Over the years I’ve increased the recipe volume – you can certainly halve it easily enough. I like to have leftovers to freeze. Linguine is my pasta of choice for this. I also increased the amount of wine in the recipe, but not by much. I caution you about one thing, though: canned tomato sauce – most are very, very high in sodium. When this sauce reduces down, the sauce will be too salty, so I recommend you use a low or no added sodium tomato sauce. Read the label! 1. In a large, heavy skillet, slowly brown the crumbled sausage; drain off fat. Add onion and sauté until limp, then add garlic and mushrooms. Continue cooking for 2-3 minutes. 2. Add Zinfandel wine, tomato sauce, herbs and spices. Bring to a boil, partially cover pan, and reduce to a simmer. 3. Cook for 2-3 hours, stirring occasionally, until the sauce is reduced to a thick consistency. Taste and adjust seasonings. Serve over cooked pasta and top with grated parmesan. This freezes well. It is best if prepared a day ahead. Posted in Pasta, Veggies/sides, on April 30th, 2008. Only vaguely do I recall when Rice-a-Roni came on the market. Way so many years ago. 1958 to be exact. It was a time when food producers were coming up with just the beginnings of boxed mixes. Cake mixes had been around for awhile, but not much of anything else. I thought the rice mixture was quite good. Tasty for such an easy combination in a box. But then the food police told us about sodium, and I began noticing how much was in lots of the foods I purchased. There still is a lot of sodium in many prepared foods. I started avoiding those products, especially after the medical experts told us we were only supposed to consume a max of 2,000 milligrams a day. It’s easy to consume double or triple that if you eat out and/or eat pre-packaged foods. Because Rice-a-Roni was so high in sodium I stopped buying it. By the way, it’s now owned by Quaker Oats. Beginning in the late 1960’s I started avoiding nearly all packaged and ready-made foods altogether, in favor of making things myself, adding only fresh food, fresh vegetables, my own herbs and spices. And I’ve continued to adhere to that with only a few exceptions. There are a couple of cake mixes I do use for some family favorites. I do buy an occasional frozen vegetable, some Trader Joe’s mixes (that contain no additives or preservatives). And once in awhile I buy Pillsbury biscuits because I have one recipe that is just so good and easy. I try to buy organically fed meat. Sometimes I buy organic produce. Not always, depending on the quality or freshness of it. Having done a search for this posting today, I discovered that the combo of rice and pasta is an Armenian thing. I thought it was Italian, but no. The founders of Rice-a-Roni actually created it from something served to them by an Armenian neighbor. Thus, the rice boxed mix was born. And why they must add so much sodium to it is beyond me. But they sure enough do. Because I always walk right past that boxed mix section in my grocery store, I’d forgotten all about the rice/noodle combination until a recipe was printed in my local food section last week. Labeled Carrie’s Rice, it is identical to hundreds of other pilaf recipes out there on the internet. 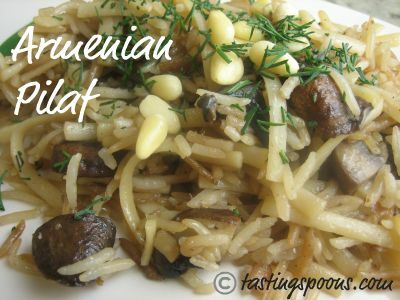 Some add mushrooms, garlic, maybe some dill weed, pine nuts perhaps, but they all contain noodle-type pasta or orzo, white rice, butter, onion and chicken broth. Some recipes brown only the pasta; others brown both pasta and the rice. If you use low-sodium chicken broth, as I did, you’ll likely want to add some salt to it. And you can vary the amount of butter. Many recipes call for a full stick of butter for 1 cup of rice and 1 cup of pasta. I cut it down by half, and think that was still too much. So I’ve reduced the amount even more in the recipe below. It’s a very quick side dish. The kids will like it, and since you’re doing all the cooking of it, you know exactly what’s in it. Unadulterated rice, pasta, butter and canned broth. Maybe some onion, and/or garlic too. 1. In a heavy skillet or saucepan melt butter, then add pasta, rice and onions. Stir and cook until the mixture is lightly browned. Add mushrooms at this point, if using, and cook them for about 2 minutes. 2. Add broth all at once, bring to a simmer, cover and cook over very low heat for about 20 minutes, until rice is completely cooked, but not mushy. Taste for seasonings (salt and pepper). Garnish with pine nuts and dill, if using. Serve immediately. Per Serving: 246 Calories; 8g Fat (26.1% calories from fat); 11g Protein; 38g Carbohydrate; 1g Dietary Fiber; 10mg Cholesterol; 24mg Sodium. Posted in Fish, Pasta, on April 5th, 2008. This recipe requires the telling of a travel-related story. Some years ago (I’m guessing it was about 15) my DH and I went on a white-water rafting trip in Idaho. My DH was quite surprised when I mentioned the trip to him. What, he said? You WANT to go camping in the remote wilderness? I said, well, yes, because the guides do all the work, all the cooking, and we’re just there to immerse ourselves in the scenery and enjoy the food. The relaxation. The clean air. I have fond memories of my childhood when my parents and I went camping in the High Sierras (the inland ridge of mountains that divide, almost, California from Nevada). My dad loved to fish; my mom not so much, but she enjoyed lazy days in the camp, reading magazines, a book, playing games of Scrabble (which I still love to this day). Sometimes I went fishing with my dad, but usually got bored after awhile. I had my own pole, usually a hand-me-down from my dad. We fished for trout in those cold, crisp mountain streams, seeking out the deep pools of water, near rocks, where the trout loved to hide. We tent camped, but my parents did 99% of the work, so I didn’t realize until I was an adult about how much effort was involved in setting up the camp, or cooking meals. Or doing dishes. Or laundry. Or even the packing that went on at home for a couple of weeks before the trip. Since those days I haven’t camped much, and would prefer to do it in a camper or trailer if the option were to come up. My DH, however, has no interest in camping, even in a luxury vehicle. He likes water. The ocean, mostly. (We have a sailboat, and that’s HIS idea of camping.) But when I suggested the Idaho river-rafting trip, maybe it was the water that intrigued him. At any rate, we went, and signed up for a trip that was not only a “gourmet” trip, but a wine-tasting trip as well. Salmon River Outfitters had been written up in Gourmet. That’s all the mattered to me – if Gourmet thought it was a great trip with great food, surely we would too. And indeed we did. SRO has new owners, but I’d suspect they would have continued the tradition. The weather was unseasonably cold the year we went (in July), and we were very, VERY limited in what we could take with us (they had mailed us a small waterproof cloth duffle bag and everything, absolutely everything we took had to fit into this bag). We slept in sleeping bags they provided with a small 2-man tent that goes up in nothing flat. We were required to set up our own tents and if rain threatened, we needed to dig small drainage ditches around the tent. We did have rain a couple of times, so it was a good thing we dug the ditches. A couple went along on that trip from Granite Springs winery (in California gold country, and now part of Latcham winery), and every night they provided some delightful wines for all of us to enjoy before and during dinner. The meals the guides prepared were positively amazing. I don’t remember now what all they made, but they were outstanding. The guides set up a couple of small camping prep tables and two kerosene stoves, and from those limited resources, they prepared meals you’d think were from a gourmet restaurant. So, one night, they made this pasta dish. And everyone just adored it, me included. Toward the end of the trip they told us they had a “book” they’d sell us for a fee. It contained the story of Salmon River Outfitters and some, but not all of the recipes, but the most popular ones, this pasta dish one of them. So, of course, I had to buy the book. And I’ve made this pasta numerous times since, and never fail to remember the fun we had on that river rafting trip, and how scrumptious this tasted as we sat by the burbling river, listening to the hawks, the birds, the bees, spotting eagles soaring at high elevations too. Cook’s Notes: this dish does take some moderate amount of prep. Lots of cutting and chopping, but once done, the dish comes together quickly. I added a little bit of chicken broth to the sauce just to give a bit more fluid to it. If you end up mixing up the two parts of the sauce, don’t worry – I’ve done it myself, and it doesn’t seem to matter. Be sure to use both Feta and Romano cheese (don’t skip, because the Feta is an important component). 1. Bring 1 quart of water to a boil and add pickling spice and shrimp. Simmer for 3-4 minutes, or until shrimp turns pink and curls. Cool under cold running water, peel and devein. 2. Heat olive oil in large skillet. Add mushrooms and garlic and sauté for about 5 minutes. Add basil and parsley, then shrimp and lemon juice, and cook for about 5 minutes. Add Piazzaiola Sauce and heat through. 3. In a large kettle, bring a large quantity of water to a boil and add the pasta of your choice and cook until al dente. Rinse in hot water, drain briefly, then toss with shrimp/sauce mixture. Add Feta, capers and cherry tomatoes, then sprinkle with Romano and serve immediately. 4. PIZZAIOLA SAUCE: In a large kettle heat olive oil until a light haze forms over it. Remove from heat and add garlic and bell peppers. Stir while it cooks, off the flame. Peel, seed and chop the tomatoes. Add oregano, salt, pepper, basil, sugar and red wine. Add to mushroom mixture. Per Serving: 679 Calories; 14g Fat (19.2% calories from fat); 42g Protein; 92g Carbohydrate; 4g Dietary Fiber; 188mg Cholesterol; 436mg Sodium. Posted in Pasta, on February 29th, 2008. Ralph Waldo Emerson wrote: “Build a better mousetrap and the world will beat a path to your door.” Well, the quote doesn’t exactly fit my purpose here, but close. There are creative people who thrive on finding a different solution, an innovation, to a problem. In the culinary world, chefs need to create on a dime. Every day. Here, we’re talking about pasta. And there’s nothing quite like overcooked pasta. I do like it just barely done – but al dente still. So, instead of guessing and having to remove a strand of lingine from the boiling pot, here’s a foolproof and very Italian method. There really is more than one way to boil pasta. I know, this isn’t exactly a very interesting post subject, but I ran across something in my stack of recipes that I’ve had for years, and used many times. So, I thought I’d share it with you. The advice came from a cooking instructor. What class, I can’t tell you. It’s something she passed out to all of her class participants, every class she teaches. And it’s a photocopy from the back of a package or box. Agnesi is an Italian company – they do have a website, but it’s all in Italian. Anyway, the instructor was also a caterer, and she said this is her failsafe method. She uses it always. And as long as I remember, on those occasions when I do make pasta, it’s worked like a charm. Posted in Pasta, Veggies/sides, on February 14th, 2008. You know, orzo is a rice-shaped pasta. Once it plumps up, it grows a bit in size, but still looks like large, very large, grains of rice. And carbonara is a rich, cream-laden Italian preparation of pasta with bacon as the primary flavor. Yet, risotto is a creamy rice preparation too, that can vary with the additions. So, Phillis Carey combined all of these culinary variations and created a great risotto-like pasta side dish. Since I like bacon a whole heck of a lot, and thyme is my most favorite-est herb, this satisfies like comfort food. The preparation is fairly simple, although you do have to heat up the broth and be near the range when you’re making this. But you don’t have to stir for 30-45 minutes like you do with risotto. It comes together in about 30 minutes. Cook’s Notes: you may need to add more liquid to this – depends on how long it takes to cook the orzo. If you’ve run out of broth, just add water. This wants to be on the wet side – it should not be stiff when served, but creamy, soft. Once you add the cream and bring it to a simmer, have everything ready because you want to serve this immediately. I mean immediately. 1. Cook bacon in heavy saucepan over medium heat until crisp, about 8 minutes. Using a slotted spoon transfer bacon to paper towels and drain. 2. Pour off all but 1 T. of drippings from pan. Add butter and melt. Add orzo and toss in butter. Add 3 cups chicken broth and bring to a boil. Simmer, uncovered, adding more broth as needed to keep orzo from sticking to bottom the pan. Cook orzo until just tender and broth is absorbed, about 8-10 minutes. 3. Add heavy cream and bring to a simmer. Mix in cheese, bacon and thyme and season with salt and pepper to taste. Serve immediately. Per Serving: 426 Calories; 15g Fat (29.5% calories from fat); 22g Protein; 58g Carbohydrate; 2g Dietary Fiber; 31mg Cholesterol; 178mg Sodium. Posted in Pasta, on February 9th, 2008. I’m on a roll. Trying some of the recipes amongst the hundreds of clippings I sorted through a few days ago. 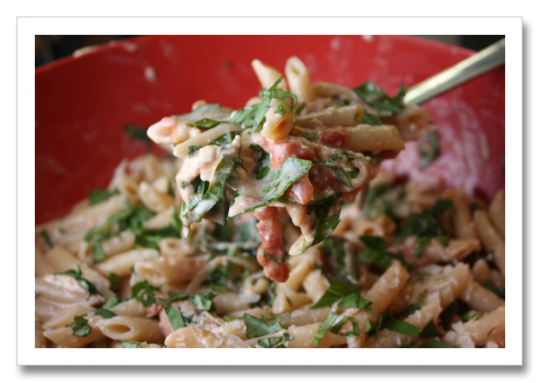 This one was only about 7 months old – after I broke my foot last summer I watched a heck of a lot of television, and this was one of Giada’s Italian recipes that sounded so good, and I knew I’d enjoy it. It’s easy to make, too. Can’t beat that combination. I really can’t say that I make all that many recipes from Food Network shows. I enjoy watching some of them (as theater, I suppose) but only occasionally do I go to the Network’s site and print out a recipe. 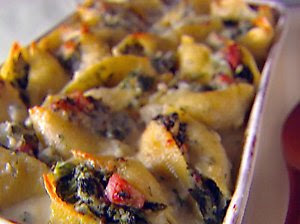 Here is Giada De Laurentis’ stuffed jumbo shells, placed in a baking dish. Photo from the Food Network. I almost always have pancetta on hand, but I didn’t have the 3/4 inch cubes Giada mentions in the recipe – I had the tiny cubed pancetta that I get from Trader Joe’s in 4-ounce packages. DH offered to go grocery shopping for me, so I wrote down “large pasta shells.” I should have known that “jumbo” was what I wanted. Soooo, I had to improvise a bit. The large shells are way too small to stuff, so I just made a casserole of them instead. Am sure they tasted the same, but most definitely didn’t look as attractive as Giada’s. The Asiago cheese is part of what “makes” this dish, since it has a kind of sharp taste. Good, though. And the dash of nutmeg in the mixture was really delish. The dish is rich, so it’s filling. Maybe a bit too rich for me. DH liked this a LOT. Said I could make this anytime. Any day. Night. Whenever. 2. For the shells: Bring a large pot of salted water to a boil over high heat. Add the pasta and cook until tender but still firm to the bite, stirring occasionally, about 8 to 10 minutes. Drain pasta. 3. Warm the olive oil in a large, heavy skillet over medium heat. Add the pancetta and cook until lightly golden, about 5 minutes. Remove the pancetta from the pan with a slotted spoon and transfer to a large bowl. Add the spinach, ricotta cheese, asiago cheese, pepper, and nutmeg. Stir to combine. Stuff the shells with about 2 tablespoons of the spinach mixture each and place the stuffed shells in a large, buttered baking dish. 4. For the sauce: Melt the butter in a medium saucepan. Add the garlic and cook for 1 minute. Add the cream and bring to a simmer. Turn the heat to very low and add the 2 cups asiago cheese, parsley, and pepper. Stir until the cheese is dissolved. Pour the sauce over the shells. Top with the remaining 1/4 cup asiago cheese. 5. Bake until golden on top, about 25 minutes. Remove from the oven and serve immediately. Per Serving: 410 Calories; 31g Fat (66.9% calories from fat); 26g Protein; 9g Carbohydrate; 4g Dietary Fiber; 103mg Cholesterol; 1419mg Sodium. Posted in Pasta, Vegetarian, on September 2nd, 2007. It was a few years ago and we flew from California to Philadelphia to attend the wedding of a young couple, friends. They’d met in San Diego, actually sailed with us on our boat one afternoon soon after they’d met. He was, is, a Navy pilot and close with dear friends of ours from Philadelphia. We thought they made a fine couple and wished them much happiness. The groom’s mother prepared a lovely feast for the rehearsal dinner. There were many hands helping in the kitchen, mine among them, and I fell in love with this incredibly easy side dish (or, it could be a main dish as is, or add some protein of some kind too). I watched as MaryAnn made this sauce – she opened cans of chopped tomatoes, cubed up some cream cheese, chopped some basil, added a tad of wine vinegar, fresh garlic, and olive oil. All this was stirred up in a very large bowl, covered with plastic wrap and left to sit out for about 6 hours. The flavors developed, obviously and the cream cheese kind of dissolved, sort of. At serving time she made a heap of hot penne, combined the sauce and poured it onto a very large platter with additional basil and sprinkled the real-thing Parmesan cheese and it was done. The total amount of actual work in this is about 5 minutes. (I’m not counting the time to cook the pasta, of course.) Maybe 10 max. If you need to hold the sauce for longer, put it in the refrigerator. Just bring it back to room temp before serving. The dish can be served at room temp, actually, but I think it’s best hot. And I’ll tell you, this is absolutely fabulous. I’ve made it many, many times since. It’s a cinch for guests. Tastes beyond wonderful. Thank you, MaryAnn. What’s good: well, that it’s so incredibly easy to make. You and your guests will rave about it. And yes, you DO leave it out at room temp. I think the acid in the tomatoes must be what keeps the dairy (cream cheese) from developing bacteria. It’s also delicious as left overs. A must make. COOK’S NOTES: This takes about 5 minutes to prepare the sauce and it’s DONE! You can use any kind of pasta, but choose one that will hold some of the sauce (i.e., not linguine or spaghetti) in its crevices. These days it seems odd to let food sit at room temp for several hours, but when I was first served this, it was left out and later served to 30 people without a problem. A double batch was JUST enough (small servings) for 30 with an entree, green salad and ample appetizers. My favorite tomatoes are Muir Glen fire roasted, but any brand will really be fine. Muir Glen is carried at Whole Foods. 1. Combine all ingredients (except pasta and cheese) in a large bowl, cover and allow to sit for several hours at room temperature. 2. Boil pasta just until barely tender, drain, add sauce to pasta, stir and pour into a large serving bowl. Sprinkle cheese on top and additional basil, if desired. Per Serving: 383 Calories; 22g Fat (50.8% calories from fat); 11g Protein; 36g Carbohydrate; 2g Dietary Fiber; 31mg Cholesterol; 239mg Sodium. 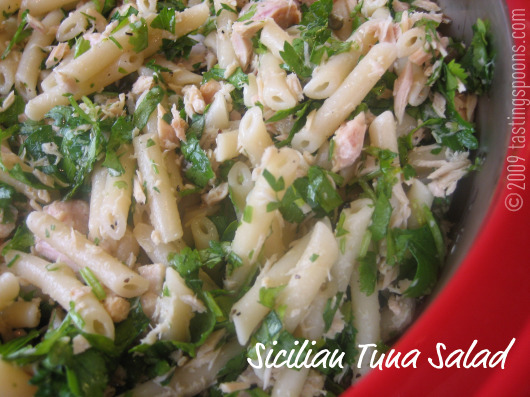 What’s Sicilian about Sicilian Tuna Salad? Posted in Pasta, Salads, on August 27th, 2007. It’s the capers, of course, that make this uniquely Sicilian. Whether the Sicilians were the first to utilize the little buds, I don’t know. I buy a giant economy sized bottle of capers at my local Italian market. A large jar isn’t cheap, but I’ve had this jar for about 5 years, I think. Caper berries are also available – they’ve just been allowed to mature to a bigger size, hence they’re berries, rather than buds. I do like capers a lot, but only in small quantity. I once ordered chicken piccata at some restaurant and it had so darned many of them, and probably a bit of the pickle juice, I couldn’t eat it. But in moderation, they add a kind of piquant character to any dish in which you choose to use them. Just be sure to rinse them a little before using them. I think capers are not common in tuna salad, but when I had this, it was just really, really good. There’s nothing else in it that is that unusual. I’ve never been able to put my finger on why this combination is so darned good, but maybe it’s the capers and lemon juice together that bring something different to the equation. And the fact that you use imported tuna packed in oil. And there’s no mayo in it. There’s just lots of flavor there. Sicily abounds with lemons. There are lemons on trees obviously, lemons in the market, lemons in art, lemons in ceramics, lemons even in the ancient carvings. If you buy dinnerware, often it will contain pictures of lemons. The early people obviously found every possible way to utilize the citrus. Sicilians use lemon juice in lieu of vinegar, so it’s found in every avenue of their cuisine. And how could I forget Limoncello? Oh, so good is that liqueur. But we’re talking about a pasta salad here . . . this came from a Joanne Weir cooking class some years ago. 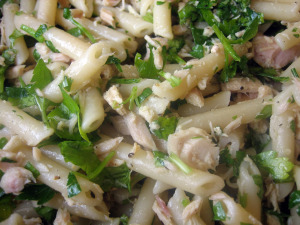 I’d have gone right on by this recipe had I not tasted it, figuring what’s one more cold pasta salad with tuna. But this was just different. Better. Tastier. Tangier. Every time I’ve made this it has renewed my enjoyment of it. COOK’S NOTES: Buy the oil-packed tuna, since the flavor is significantly better. The salad is really good and can be made up ahead. It keeps for 4-5 days with little or no deterioration. 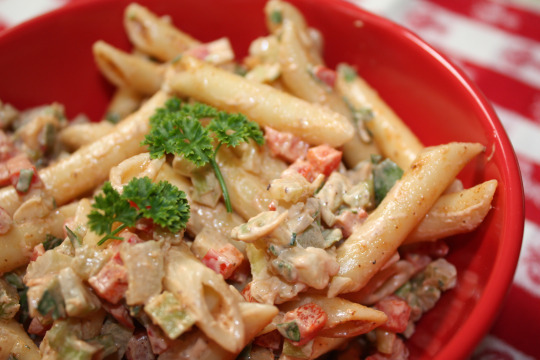 It is a fairly dry pasta salad – you can add more oil if you want to. If it’s summer and you can find good tomatoes, they are a wonderful addition to the top of the salad or on the plate with it.You can use different pasta if you would prefer. 1. Drain the tuna as much as possible. Place tuna in a large bowl and using a fork break it into flakes. Set aside. 2. Bring a large pot of water to a boil. Add a teaspoon of salt, then add the penne, stir well, and cook ONLY until pasta is “al dente,” firm to the tooth. This will be about 10-12 minutes depending on the brand. Drain well. 3. Meanwhile, into the bowl add the lemon juice, olive oil, remaining salt, and the pepper. Then add the hot, drained pasta and stir well. 4. Add the capers, parsley, basil, and cilantro and mix gently. Taste and adjust for seasonings. Cover and refrigerate for at least an hour before serving. 5. Transfer the salad to a serving bowl or divide amount individual plates. It is better if it is served at near room temperature. Garnish with additional Italian parsley sprigs or basil leaves. Per Serving: 359 Calories; 11g Fat (28.4% calories from fat); 20g Protein; 44g Carbohydrate; 2g Dietary Fiber; 8mg Cholesterol; 970mg Sodium. Posted in Pasta, Vegetarian, on July 30th, 2007. About 20 years ago a wonderful restaurant opened near our home, called Zov’s Bistro. Owned by Zov (pronounced like the letter oh) Karamardian, it was open for weekday lunches and a few nights a week for dinner. As the restaurant grew, and Zov’s well-executed Mediterranean food became more well known, they opened every day but Sunday. Zov is a wonderful philanthropist in our community, and loves to share her native Armenian cooking, although she has broadened the scope to include recipes from many different cultures around the Mediterranean. Now the restaurant houses the bistro, a bakery and a she’s opened a couple of other locations as well. But back in the earlier days of the Bistro, Zov taught a cooking class starring some of her family favorites, of which this recipe was one. It’s not on the restaurant menu, unfortunately, or I would have it more often. I have no recollection what else she made that night, but I fell in love with this simple pasta dish, and have been making it ever since. You need to enjoy garlic, as it plays a prominent role. And the sauce needs to sit for awhile (at least an hour, or up to 2-3 hours) to develop its flavors. You can make this any time of year – it’s nothing more complicated than canned tomatoes, garlic, green onions, olives, capers and olive oil tossed with hot pasta and sprinkled with real Parmesan. It has some other things in it too that enhance the flavor, and you garnish with a lot of fresh basil. The anchovies (buy good ones if you can find them . . . they have so much more flavor than the cheap cans at the supermarket . . . go to an Italian deli if you have one) give it some character, but you never know they’re there. 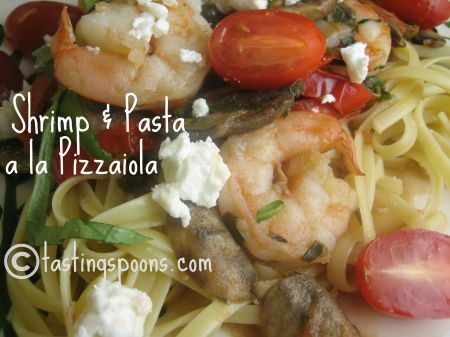 This is a great meal for a warm summer night. So, I have a fun story to relate about this recipe. We had dinner with our son, Powell, and his wife the other night, and I mentioned that I had written up this recipe, which has always been a favorite of his. I’d forgotten that when he first met Karen he offered to help her with catering food for an art event a couple of weeks later. She wasn’t a caterer, but had offered to help a friend and was happy to have some help with it. Powell enjoyed cooking and loved entertaining when he was a bon vivant bachelor. Anyway, back then Powell had phoned me to ask advice on what recipes I had that might work for such an event where they could do no actual cooking, so they’d have to make everything ahead. This recipe was a standout for doing ahead, no question. According to Karen, she was mightily impressed when Powell made this in a very large quantity for her event. According to Karen, her thoughts were along the lines of wow, this guy may be a keeper. It was a black-tie event, and the two of them served this dish and a bunch of others to the crowd of people. Toward the end, with Powell standing nearby in his tux, a businessman approached him and asked for his card. Probably Powell looked at him askance. Uhm. The guy said, we’d like you to cater something for us at our home. Powell laughed and said, we really don’t DO catering, etc. The guy said, well, what do you do and Powell explained that he is in the investment banking/bond biz. The guy looked at him and said what in the world are you doing here? Powell & Karen had a good laugh over that. 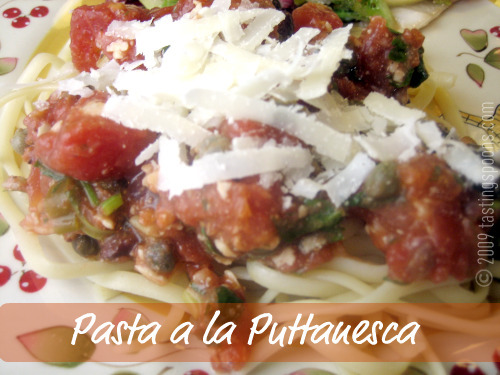 So, a romance was made that night, according to them, over a big bowl of Pasta a la Puttanesca. 1. Heat the small quantity of olive oil in a small skillet and add green onions. Cook for 2-3 minutes, then add minced garlic. Allow to cook together gently for 2-3 minutes. Do not brown. 2. 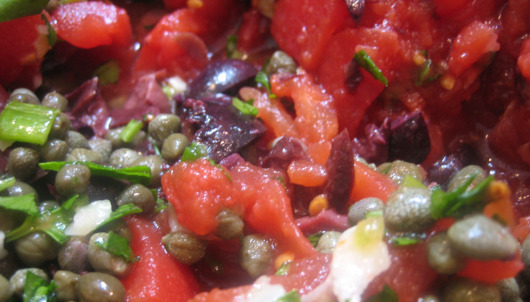 In a large, non-metallic bowl combine the tomatoes, pitted olives, capers, anchovies and add the onion/garlic mixture. Add parsley, basil, chili flakes, pepper. Slowly stir in olive oil and allow to sit at room temperature for about an hour. Fold in cheese just before serving. Can be made a day or so ahead, but add fresh basil and cheese at last minute. 3. Cook pasta of your choice, drain, and pour into large bowl. Pour room temperature puttanesca sauce on top and sprinkle with additional cheese. Serve immediately adding strips of chicken on the top if desired. Recipe says you can serve it warm or cold. Or, place a serving size of hot pasta on a plate and add about 1/2 cup of mixture on top. Traditionally you should use Kalamata olives in this, but any other kind of Mediterranean cured olive will do.